Our national anthem, Jan Gan Man was composed by ace poet Rabindranath Tagore. Initially, it was known as Bharato Bhagyo Bidhata and was adopted by the Constituent Assembly of India on 24 January 1950 as country’s National Anthem. Celebrating the anniversary of our National Anthem, Newscrust brings to you the journey of Jan Gan Man. Jan Gan Man was first publically sung on 27 December 1911 in Calcutta at the session of the Indian National Congress. In 1911 Rabindranath Tagore composed the lyrics and music of Jan Gan Man. Earlier Jan Gan Man was composed in only in Bengali language, but later was translated in Hindi and Urdu by Abid Ali. In January 1912 at an annual event of the Adi Bramha Samaj the Jan Gan Man was practiced though at that time it was in Bengali and was largely unknown except to the readers of Adi Brahmo Samaj Journal i.e. Tattwabodhini Patrika the need of its translation in Hindi arose. It is said believed that "the Bengali poet RABINDRANATH TAGORE sang a song composed by him specially to welcome the emperor. "(an Englishman December 28.1911) when the proceedings began by INC on Wednesday 27th December 1911, a Bengali song was adopted unanimously. On the occasion of Indian attaining freedom, the Indian constituent assembly assembled for the first time as a sovereign body on 14 august 1947, midnight and the session closed with an unanimous performance of Jan Gan Man. The members of Indian declaration to the general assembly of United Nations held at New York in 1947 gave a recording of Jan Gan Man as the National Anthem of India. The national anthem has been divided into two types of versions i.e short version & long version. A short version consisting of the first and last lines of the anthem are played on certain occasions. Whereas in the full or long version the complete anthem is played. At some part of a liberated Indian public it was a matter of debate even till the Independence. "Dravid" includes people from south though Dravid specifically means tamil and even then, the same consideration is not given for south since there are distinct dialects and cultures in South India. Similarly, in 2005 there were calls to delete the word" Sindh" and substitute it with Kashmir. The argument was because Sindh was no more a part of India, and had become the part of Pakistan as a result of the partition of 1947 which was resolved by opponents that the word is used for Indus and Sindhi community of India. 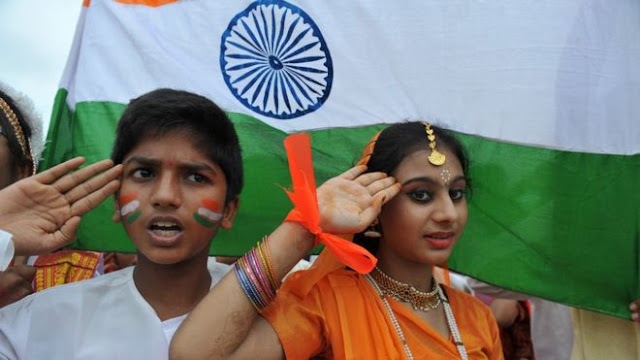 National Anthem was played or sung on different occasions and thus there is a need of paying respect to the anthem by observance of proper decorum on such occasions. There are certain guidelines and instructions to be followed while singing or playing of Jan Gan Man by Government of India. In case of complete version of national anthem the full song must be finished in approximately 52 seconds while in case of short version it is just 20 seconds. All the persons are compelled to stand and give respect to the National Anthem of our country. Before 1975 it was a custom to play it in theaters after the movie screening, it was however banned because of disrespect by people who would not stand up or pay attention when the anthem was being played. Therefore, it would create disorder and confusion rather than add to the dignity of anthem it was stopped in theaters. on 1 December 2016, again Supreme Court ordered to play national anthem in theaters in order to instill "committed patriotism and nationalism ".